Marduk ( 𒀭𒀫𒌓 ) is an ancient deity with origins in Mesopotamia. We know he was a protection-God of Babylon in 4000 BC. He was associated with light and wisdom. 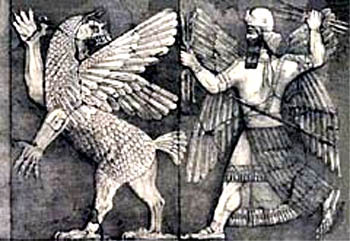 Marduk's symbol was the dragon Tiamat, which he defeated as a Storm god. It was of the body of Tiamat that Marduk created the Universe. Worshipper of Marduq in Babylon recited holy texts before the mighty golden statue of Marduq the sun God. And his son, Nabu, playing at his feet with writing equipment. The emphasis on holy texts and the ritual reciting could have influenced early Hebrew tribes to do the same with their holy book, the Torah. As a God of Light, Marduk watched over the artists; dancers, painters and sculptors alike. Marduq fights Tiamat, `Chaos monster and sun god ca. 700 v.Chr. Marduq has a Son with his wife, the goddess Serpanitum. His name is Nabu and he is the God of Writing. He is usually shown as Marduk`s Scribe of sometimes as is First Minister.